A Government spokesperson said, “In July 2017, the Department of Health launched the Bermuda 50 Million Steps Challenge. 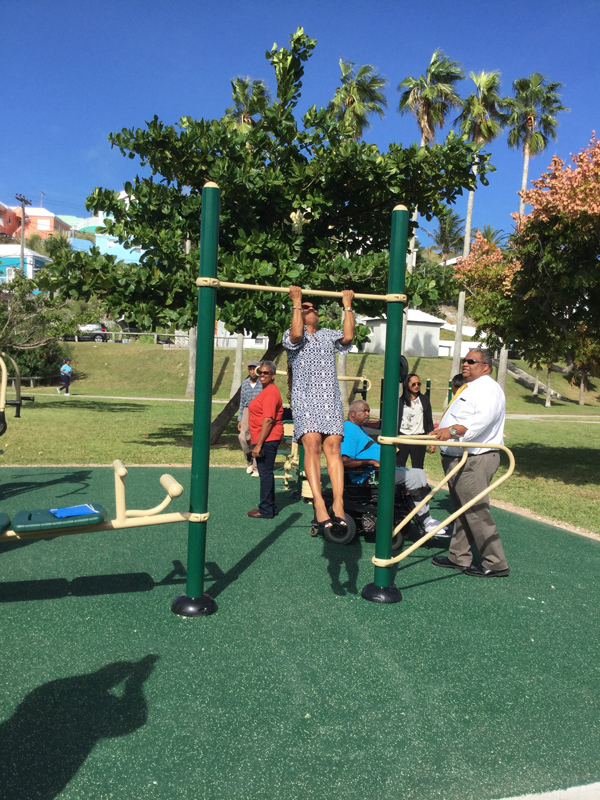 It was an opportunity for residents to improve their health while having fun at the same time. “Participants were encouraged to join their parish team and collectively walk 50 million steps. In addition, friendly competition between the nine parish teams was encouraged in order to see which team would be ranked with the highest step average. “With over 200 participants, the Bermuda parish teams were able to surpass the 50 million steps goal and walked 100,146,130 steps. The winner of the team Challenge was Team St. George’s Steppers and the prize awarded was outdoor fitness equipment. 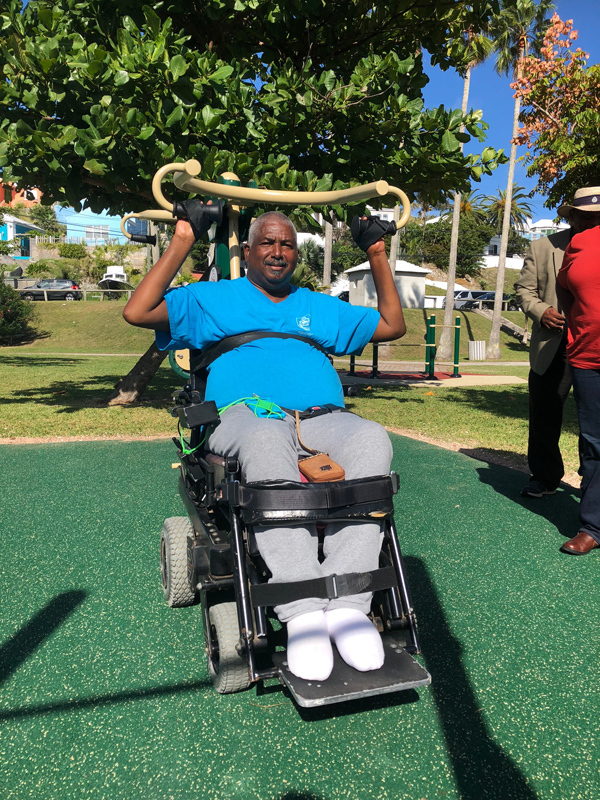 “Today, the Minister officially recognized the completion of the installation of the outdoor fitness equipment and handed it over to the residents of the St. Georges community. Minister Wilson said, “Bermuda is at a health crossroads. According to the STEPS Health Survey of Adults in Bermuda 2014, 75 percent of adults were overweight or obese [40.2% and 34.4%, respectively]. “Only 18% of adults consume five or more serving of fruit and/or vegetables per day. Thirty-three percent reported having high blood pressure and 12% reported having diabetes. “It is obvious that a concerted effort must be made to decrease these modifiable risk factors – such as overweight and obesity, physical inactivity, poor diet, high blood sugar and high blood pressure. “And we must take an “all-of-society” approach to tackle the obesity epidemic . . . from the private and public sectors; supermarkets and restaurants, educators and policy makers. 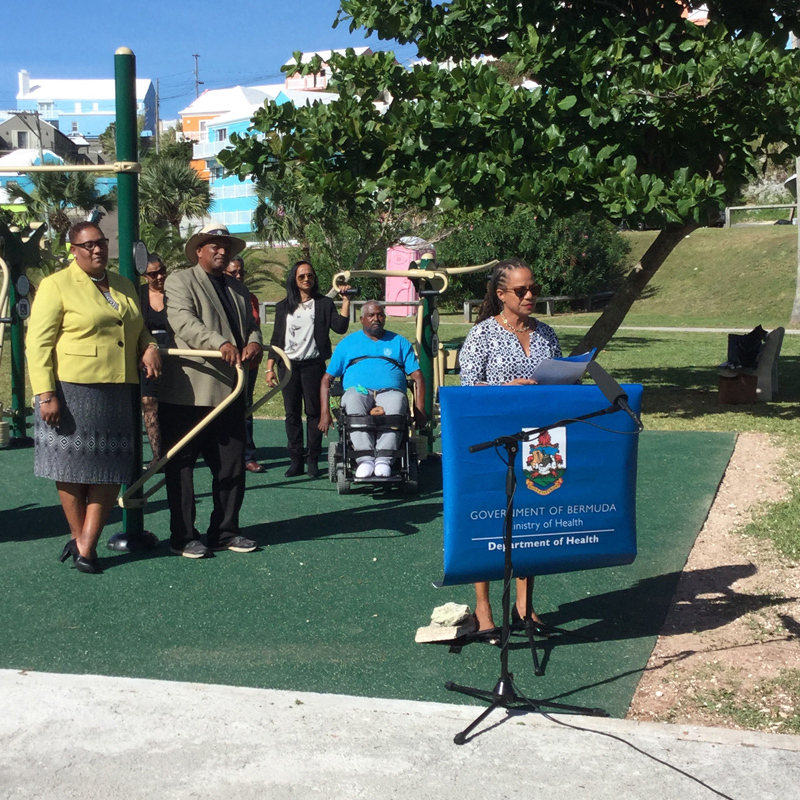 “In July 2017, the Department of Health launched the Bermuda 50 Million Steps Challenge. 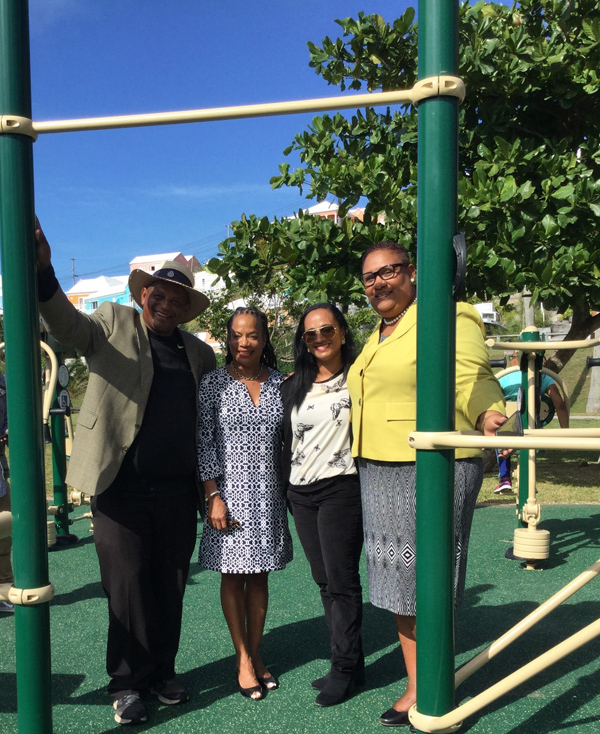 It was an opportunity for residents to improve their health while having fun at the same time. “Initiatives like this promote the importance of active living. Physical activity and healthy eating have long been proven to reduce the risk of chronic non-communicable diseases such as diabetes, heart disease and cancer. Consistent physical activity like walking helps also improve quality of life, mental health and healthy aging. 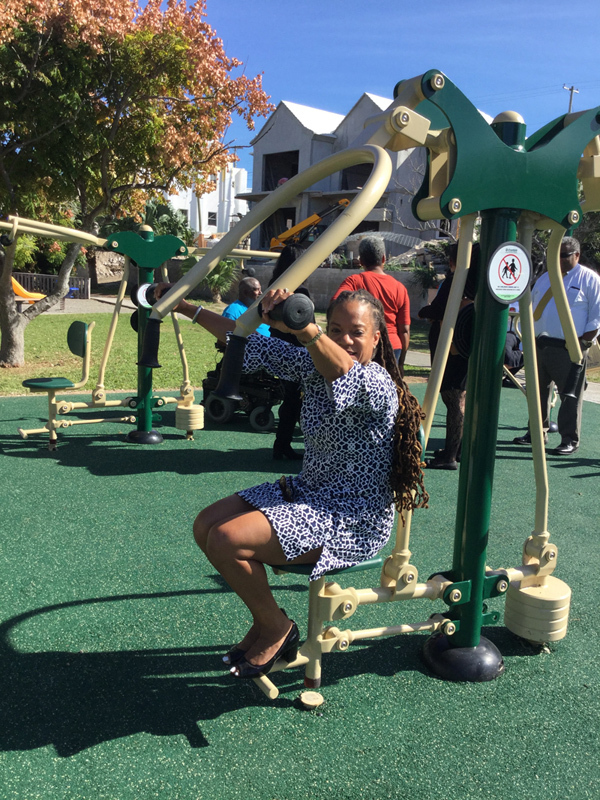 “Today, we are here to officially recognize the completion of the installation of the outdoor fitness equipment and hand it over to the residents of the St. Georges community. “Well done Team St. George’s Steppers. This equipment will help this community to improve its health while having fun at the same time. MP Wilson in beast mode on that pull-up bar. Yeah, I was going to say she didn’t have appropriate dress for a workout session but yeah, props due. Facility looks solid. Some equipment that the disabled can utilize as well, brilliant. Yes I. No need for gym membership now! 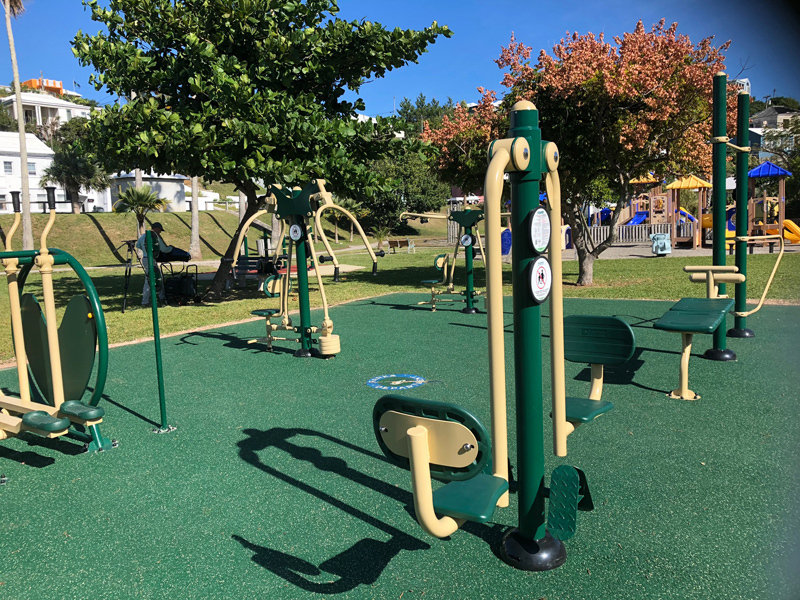 OBA delivers hotels and cruise boats in St George and the Pee El Pee deliver gym equipment. Wow, what a difference!! LMFAO! !